1950s style glitter tinsel tree, small. retro chic mid-century modern style christmas tree. small, simple and effective. our quintessential mid-century modern christmas tree is back! 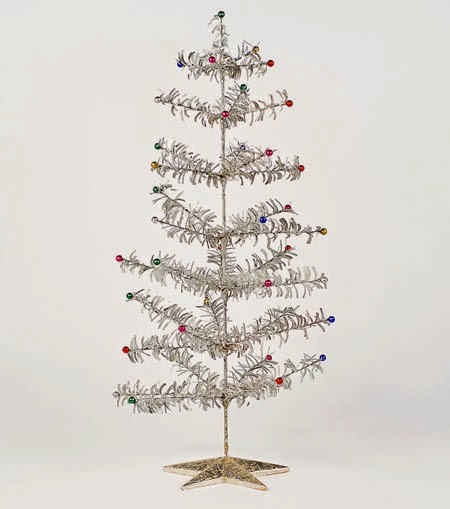 this classic tinsel tree is one of our favorite pieces of retro 1950s americana. our fabulous new take on the mid-century modern 'retro chic' tinsel tree was inspired by the classic aluminum glittering christmas trees that were all the rage during the 1950s. this small (about 30" tall), inexpensive artificial christmas tree - skinny and straggly in a retro-chic way - can be put up with ease for everyone to enjoy. just because you have limited space doesn't mean that you can't decorate your dorm room to celebrate the holidays. this christmas tee measures only 30 1/2" tall which is a perfect size for smaller spaces including homes, apartments or dorm rooms. the perfect size for a corner or when placed on a small end table, this tree creates a festive feel wherever it is placed. intricately detailed for plenty of personality, our vintage inspired tinsel tree is outfitted with 36+ miniature colorful balls which gives it plenty of dazzle. a star shaped base provides the perfect finishing touch. this beautiful retro 1950s style x-mas tree will be expertly packaged to ensure safe travels. the perfect tree for just about anyone that likes to put a mid-century modern spin on the holiday season with a minimum amount of effort. our dazzlingly cool tree comes pre-assembled right out of the box. just fold into place and it is ready to be displayed. currently on sale for $79.99, this tree provides instant charm without breaking the bank. price is for 1 (one) tree as pictured.